Culinary travel is the next big thing, from cooking classes in Tuscany to street-food tours in Istanbul. So where will you plan your next foodie adventure? Culinary travel is the next big thing, from cooking classes in Tuscany to street-food tours in Istanbul. So where will you plan your next foodie adventure? Whether you prefer chasing Michelin stars or channeling your inner Andrew Zimmern, these global destinations will wow your taste buds. Here are the top seven places to eat around the world in 2013. The small seaside city in northern Spain's Basque region is the world's ultimate foodie destination, with more Michelin stars per capita (currently 16) than anywhere else on Earth. Both Arzak and Mugaritz grace the top 10 of S. Pellegrino's World's 50 Best Restaurants. The city's charming Belle-Époque-meets-avant-garde architecture is reflected in its cuisine: experimental with an old soul. 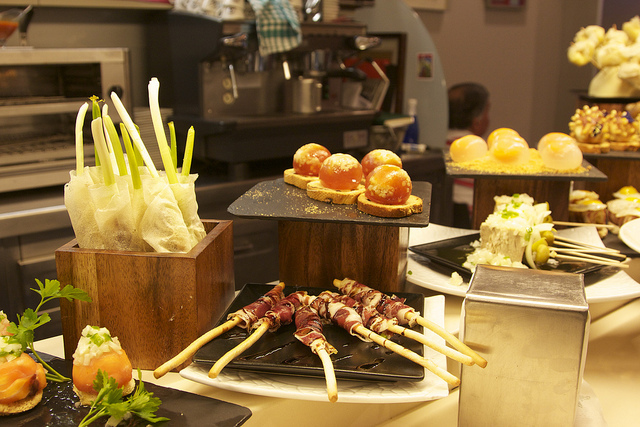 Through abundant in private gastronomic societies, colorful markets and cooking schools, the greatest culinary adventure in San Sebastian is the pintxos crawl. Twice a day, hundreds of people pour into the streets, moving from bar to bar: tasting, drinking and socializing over eclectic, artistic Basque-style tapas like anchovies, foie gras, beef cheeks and blood sausage. A sprawling metropolis and Japan's third largest city, Osaka is Tokyo's bolder, grittier little sister with an affinity for junk food and punk rock. The city is referred to as the culinary capital of Japan, famous for it's foodie philosophy of kuidaore, literally "eat until you drop." Hit the neon-lit action of Dōtonbori Street and indulge in the Osaka's beloved snack foods. Takoyaki vendors dish out steaming hot, octopus-stuffed batter balls topped with sweet ponzu, mayo and bonito flakes. Try okonomiyaki, savory pancakes piled with a wild mix of ingredients, or deep-fried kusikatsu, Osaka's answer to tempura. Other must-eats include yakisoba, udon and the region's famous pressed sushi. As Peruvian food gains gastronomic recognition worldwide, Lima's culinary scene is exploding. In 2011, restaurant Astrid Y Gastón entered the World's 50 Best list. Considered South America's culinary star, Lima's cuisine shines even at its most modest, from anticuchos, skewered beef hearts grilled street-side to pork-stuffed bodega sandwiches and late-night churros dipped in bitter chocolate. Traditional favorites include ceviche steeped in tangy leche di tigre and the Peruvian-Chinese influenced lomo saltado, stir-fried strips of marinated beef tenderloin. Currently, local chefs strive to break Lima's culinary mold, taking contemporary Peruvian cuisine to the next level, experimenting with haute ceviche and foraging unknown edibles from deep within the Amazonian forest. Kiev is the food lover's Wild, Wild East with its wide boulevards, gold-domed churches, all-night parties, vodka, caviar and ruby-colored borscht. Get acquainted with Kiev's distinct cuisine at a low-cost cafeteria-style eatery, where dozens of national dishes are offered up daily like beet and herring salad and stuffed cabbage rolls. Embrace the kitsch of peasant garb, wagon wheels and stuffed farm animals at traditional-style restaurants and dig into pork fat, pickles and thick cuts of meat. Don't miss the varanyky, Ukraine's famous stuffed dumplings are boiled or fried, best served with pork cracklings and smothered in sour cream. In Kiev, feast into the wee hours then hit one of the city's outrageous theme bars for a perilous pyrotechnic libation. This is a city that eats dessert for breakfast -- tall cups of sweet, slushy granita -- in flavors like almond, coffee or lemon, served with a freshly baked brioche for dunking. Sicily's cultural history is reflected in its cuisine, with Italian, Greek and North African influences. Hit Palermo's food stalls for authentic fare from fresh arancini, deep-fried rice balls stuffed with ragu, to panelle, chickpea fritters. Adventurous foodies should sample the city's classic street food: pani ca meusa, an irresistible offal sandwich made with fried beef spleen tucked into soft sesame bread. Palermo restaurants serve up fresh-caught seafood: sliced swordfish crudo, thick tuna steaks and spaghetti con i ricci -- creamy, rich sea urchin roe. Finish off every meal with a sugar-dusted cannoli, Sicily's iconic pastry with a velvety ricotta filling. Antigua is a vibrant, former colonial city and UNESCO World Heritage Site in the Guatemalan highlands. Mayan culture is at the heart of the cuisine with recipes dating back thousands of years. Slow-cooked, multi-layered stews like the creamy, pepper-based subanik or pepian, a spicy chicken soup, are the cornerstones of Antigua's traditional food. A stroll through the bustling Central Market is an opportunity to sample the city's best street food, from chili-dusted fruits to grilled maize flour pupusas (of Ecuadorian origin) topped with pork cracklings and vinegar slaw. Makeshift eateries are set up in church parking lots where women dish out Guatemalan-style chile rellenos, deep-fried stuffed peppers with hot tortillas. Though Antigua is an hour from the ocean, seafood havens like La Cocina de Marina serve up fresh Guatemalan-style ceviche and savory fish stews.